RBTH presents a selection of views from leading Russian media on international events, featuring reports on the signing by Russia, Ukraine and the EU of an agreement on the renewal of gas supplies to Ukraine, as well as analysis of a dispute between Kiev and the self-proclaimed republics in eastern Ukraine over the legitimacy of election dates. Gazeta.ru reports that after lengthy negotiations Russia, the EU and Ukraine have finally signed the documents concerning the renewal of Russian gas supplies to Ukraine. According to the agreements, Moscow will offer Kiev a $100 discount per 1,000 cubic meters, but it will last only until the end of the first quarter of 2015. Citing Russian Energy Minister Alexander Novak, the publication writes that the discount will be provided at the expense of canceling the export duty, and purchases will be made on the conditions of prepayment and debt restructuring. Gazeta.ru reminds its readers that Russia had already proposed to Kiev to reduce the gas price at the expense of export duty at the beginning of the summer, but the Ukrainian government refused, calling the proposal a "trap". The publication believes that back then Ukraine was afraid that Russia would cancel the discount. As of today, the enactment of the agreement is compulsory, also for the EU. Under the document, Ukraine also undertook to partially pay off its debt with Gazprom. Kiev had earlier said on several occasions that the Ukrainian budget has reserved $3.1 billion for this purpose. Despite the fact that Europe has promised to support Ukraine financially, so far this has not been officially documented, according to the publication. Nevertheless, Russia says that it trusts its partners. Gazeta.ru underlines, however, that even if the sides manage to get through the winter period, in April the confrontation will emerge anew, since the new agreement basically guarantees supplies of fuel only until the end of March. The Moskovsky Komsomolets newspaper quotes Russian Energy Minister Alexander Novak on the gas agreements with Ukraine: "We were able to come to an agreement on basic terms for supplies in the winter period from November to March and to preserve all the positions that we had declared earlier," he said. The minister says that Ukraine agreed to partially pay off its debt, which was accumulated in November-December 2013 and in April, May and June 2014, at a total of $3.1 billion. The first $1.45 billion may already be paid off in the upcoming days before the renewal of supplies, and the other $1.6 billion by the end of the year. Novak added that, considering Ukraine's difficult situation, Russia is willing to give it a $100 discount on the price established in the 2009 contract. "This is our contribution to the regulation of the gas dispute and to Ukraine's economy," said the minister. 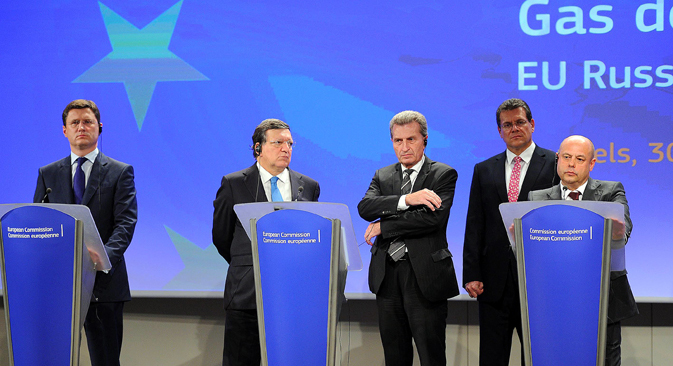 The agreement reached during the negotiations must be fixed in three documents. These are: the additional agreement to the existing contract; the protocol between Russia, Ukraine and the EU Commission; and the protocol between Ukraine and the EU Commission, which will include the financial guarantees. As soon as Russia receives the money, it will resume supplies. In November-December Ukraine intends to buy 4 billion cubic meters of gas. "Kiev has confirmed that it possesses the funds necessary to pay for this quantity," said Novak. The Kommersant daily writes that Moscow and the Donbass militias are still arguing with Kiev and the West about the legitimacy of holding elections in the self-proclaimed Donetsk and Lugansk people’s republics in eastern Ukraine on Nov. 2. According to Ukrainian President Petro Poroshenko's law "On the special order of local self-government in the separate neighborhoods of the Donetsk and Lugansk regions," the elections must be held on Dec. 7. That is why, the newspaper explains, the EU, the U.S. and the UN consider the Nov. 2 elections illegitimate. Nevertheless, Russian Foreign Minister Sergei Lavrov has announced that Moscow would recognize the results of the elections in the republics. The Foreign Affairs Ministry has told Kommersant that in accordance with the Minsk Agreements signed by the president of Ukraine, the militias, Russia and OSCE, the elections "should be held in the period between Oct. 19 and Nov. 3." Moreover, neither the Minsk Protocol of Sept. 5, nor the subsequent memorandum of Sept. 19 mentions anything about possible dates for holding the elections. According to three Kommersant sources in Russia's government organs, an amendment was attached to the memorandum, which was not published. This amendment includes the interval in which the Donbass elections must be held, and Nov. 2 falls into this period. Andrei Purgin, deputy prime minister of the Donetsk People’s Republic, confirmed the existence of the unpublished amendment to the Minsk Agreements, while President of Ukraine's Council of National Security and Defense Andrei Lysenko denied it. Meanwhile, Spokeswoman for the EU Foreign Service Maya Kosyanchich told Kommersant that Brussels "has not been informed about any secret amendment" to the agreements.